Magnetix frame is constructed of durable 8mm diameter, aircraft grade aluminum. 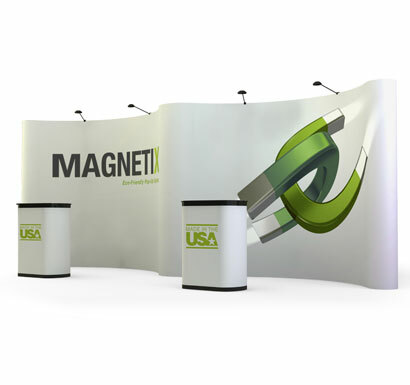 Comprised of a mixture of virgin and recycled aluminum, the frame is both lightweight and durable while utilizing less natural resources.Magnetix pop-ups employ magnetic spacer bars, which automatically lock together when the frame is expanded. This system replaces traditional spacer bars, which typically require manual locking in multiple locations. Channel bars also employ magnetic fasteners and are specially shaped to ensure a snug fit with effortless assembly. Magnetix displays are backed by a limited lifetime hardware warranty.